1. The cuticle, which is the transparent horny layer of the proximal nail groove. It adheres to the nail surface and acts as a seal between the nail plate and the proximal nail fold. 2. The onychodermal band, which is ''orangey,'' is located in the distal region of the nail. It can be partly blanched by pressure, thus exsanguinating the region. It provides a zone of rugged attachment of the nail-to-nail bed. The upper surface of the nail plate is smooth and has discrete longitudinal ridges that become more obvious with age (Fig. 2). The under surface is corrugated with parallel longitudinal grooves that interdigitate with the opposite ones of the nail-bed surface, enhancing the adhesion of the nail plate to the nail bed. The nail plate is made up of parallel layers of keratinised, flat, and completely differentiated cells with no nucleus. Three zones can be identified at the distal part of the nail: the upper (or dorsal) nail plate which makes up one third of the nail; the lower (or ventral) nail plate which makes up two thirds of the nail; and the subungual keratin. The latter corresponds to the thick, dense, horny layer of the hyponychium (Fig. 3) [3,4]. Figure l The normal nail. (l) nail plate, (2) nail grooves [(2a) proximal nail groove, (2b) lateral nail groove, (2c) distal nail groove], (3) proximal nail fold, (4) lunula, (5) cuticle, (6) onychodermal band, H, hyponychium, small dots, stratum granulosum. 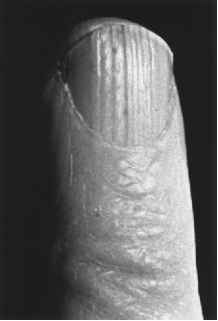 Figure 2 Obvious longitudinal ridges on the nail surface, as noticed in older people. Figure 3 Longitudinal section of the distal part of the nail apparatus. (1) upper or dorsal nail plate, (2) lower or ventral nail plate, (3) subungual keratin. H, hyponychium; DG, distal groove. In electron microscopy (Fig. 4) , the nail plate cells appear to be made of a regular weft of keratin filaments within an interfilamentous matrix. In the upper (or dorsal) nail plate, cells are flat, their cellular membranes are discreetly indented, and they are separated from each other by ampullar dilatations. At the surface, those cells are piled up like roof tiles, which gives the nail surface its smooth aspect. 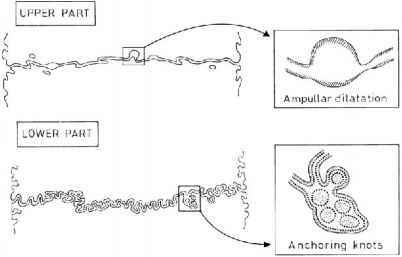 In the lower (or ventral) nail plate, cells are thicker, their cellular membranes are anfractuous, and they interpenetrate through extensions, making real anchoring knots that seem to be partly responsible for nail elasticity. Figure 5 Longitudinal section of the proximal part of the nail apparatus. 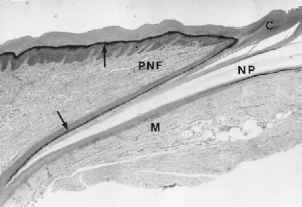 PNF, proximal nail fold;C, cuticle; NP, nail plate;M, matrix. A stratum granulosum (arrows) is present in the dorsal and ventral part of the proximal nail fold epithelium but absent in the matrix epithelium. 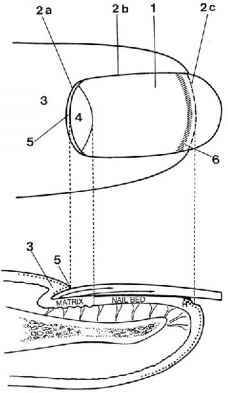 • The proximal nail fold (Fig. 5). Its dorsal part is in continuity with the epidermis of the digit back. Its ventral part is a flat and rather thin epithelium that keratin-izes with a stratum granulosum. The cuticle corresponds to the stratum corneum of the most distal part of the proximal nail fold, at the angle of the dorsal and ventral part. • The nail matrix is a multilayered epithelium characterized by an abrupt keratini-zation without interposition of keratohyaline granules (Fig. 5). It gives birth to the nail plate: the proximal part of the matrix gives birth to its dorsal part and the distal part of the matrix gives birth to its ventral part. The epithelium of the matrix also contains melanocytes and Langerhans cells. 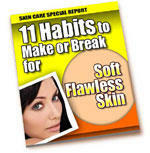 Most melanocytes are dormant  and do not produce pigment. However, in dark-skinned individuals, longitudinal pigmented bands can be observed in nails. 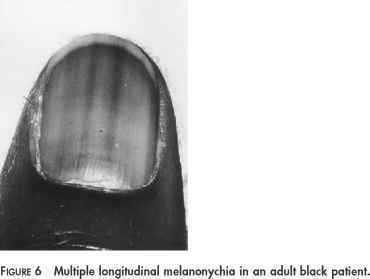 This racial physiological pigmentation is attributable to the activation of the matrix melanocytes and to the melanin incorporation in the nail plate (longitudinal melanonychia). It usually affects several nails and tends to become more frequent with aging; this can only be observed in 2.5% of 0- to 3-year-old black children but in 96% of blacks older than 50 years of age (Fig. 6) . • The nail bed epithelium, like the one of the matrix, keratinizes abruptly. 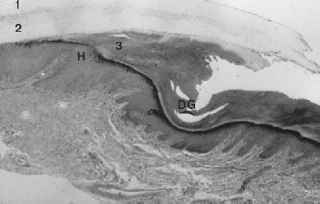 The stratum granulosum reappears only at the hyponychium, which represents the distal thickened part of the nail bed and is bordered by the distal groove and the digital pulp (Fig. 3). Melanocytes are rare in the nail bed. The nail apparatus is strongly attached to the periosteum of the distal phalanx by thick collagen bundles. Elastic fibers are rare and eccrine sweat glands are absent. The nail is highly rich in keratins, specially in hard keratins which are close to those of hair and have a high content of disulfide linkage (cystine) [1,2]. The high sulfur-containing keratins play an important role in the nail toughness and presumably in its good barrier property as well. Sulfur represents 10% of the nail's dry weight; calcium represents 0.1 to 0.2%. The latter, contrary to conventional wisdom, does not intervene in the nail toughness. Lipid content (particularly cholesterol) is low in nails: from 0.1 to 1% compared with 10% in the stratum corneum of the skin. Water concentration varies from 7 to 12% (15-25% in the stratum corneum) but the nail is highly permeable to water: when its hydration level increases, it becomes flack and opaque and when its hydration level drops, it becomes dry and brittle. Studies carried on nail permeability are important for the development of cosmetic and pharmaceutical products specifically devoted to nails . As a permeation barrier, it has been shown that the nail plate reacts like a hydrogel membrane, unlike the epidermis which reacts like a lipophilic membrane. The normal nail is hard, flexible, and elastic, which gives it good resistance to the microtraumatisms it undergoes daily. Those properties are attributable to the following factors: the regular arrangement and important adhesion of keratinocytes, the anchoring knots, the high-sulfur-containing keratins and the hydration level of the nail. The nail grows continuously. In 1 month, fingernails grow about 3 mm and toenails grow about 1 mm. A complete renewal therefore takes 4 to 6 months for normal fingernails whereas 12 to 18 months are needed for toenails [1,2]. proximal part of the matrix. This probably explains why distal matrix surgery or nail bed surgery has a low potential for scarring compared with proximal matrix surgery . Some studies suggest that the nailbed produces 20% of the nail plate, whereas others suggest that the nail bed hardly participates in the making of the nail plate [9,10]. The nail plays an important role in everyday life. It protects the distal phalanx from traumatisms it undergoes regularly. It plays a role in the sensitivity of the digital extremity and intervenes more specifically in the picking up of small objects such as needles. The nail allows scratching in case of itching and can be used as a means of attack or defense. Finally, the aesthetic importance of the nail should not be neglected. For centuries the nail has played an important aesthetic role. Having clean nails is essential to looking well groomed and refined, and among women nails also need to be long and painted. A ''good-looking'' nail has a smooth and shiny surface. It is transparent and adheres to its bed. Regarding the proximal groove, the cuticle has to be intact and thin. The distal and the lateral grooves have to be clean and the periungual tissues must be without hangnails and sores. The free border has to be smooth; its shape can be round, pointed, oval, or square. Women often wear long fingernails cut oval, which makes fingers look longer and thinner. Yet, square nails are in fashion. Too-long nails can look unpleasant and can even be a nuisance. Men wear short fingernails cut square. Both women and men have short toenails cut square. A normal nail structure and appropriate cosmetic care are necessary to obtain such ''good-looking'' nails. 1. RPR Dawber, D de Berker, R Baran. Science of the nail apparatus. In: R Baran, RPR Dawber, eds. Diseases of the Nails and Their Management. 2d ed. Oxford: Blackwell Scientific Publications, 1994, pp. 1-34. 2. D de Berker. The normal nail. In: J Andre, ed. CD-ROM: Illustrated Nail Pathology. Diagnosis and Management. Antwerpen: Lasion Europe, 1995. 3. G Achten, J Andre, M Laporte. Nails in light and electron microscopy. Semin Dermatol 10: 54-64, 1991. 4. J Andre, M Laporte. Ungual histology in practice. In: J Andre, ed. CD-ROM: Illustrated Nail Pathology. Diagnosis and Management. Antwerpen: Lasion Europe, 1995.